If you are going to the Paris Air Show, and have time, here is another take on transport. 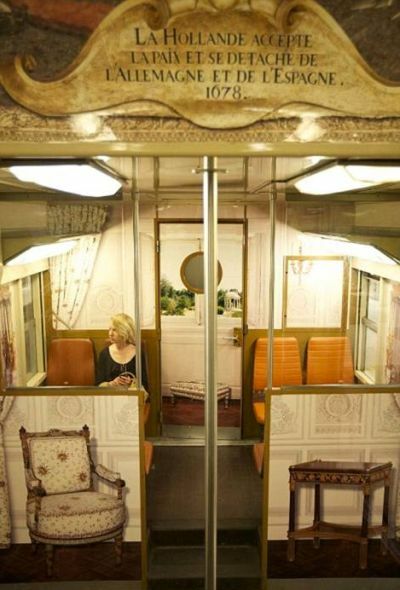 The RER train on the C line to the the Palace of Versailles terminus has been re decorated as shown here. Ornate paintings and golden sculptures line the aisles and even the ceilings are intricately designed. 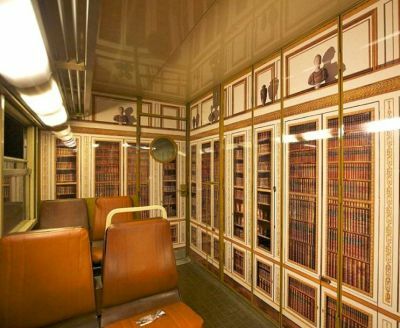 Other attractive improvements include the creation of a mock library in one of the carriages. The refurbishments are designed to evoke memories of seven different areas of the royal chateau and its grounds, including the Hall of Mirrors, the Gallery of Battles and Marie-Antoniette's estate. 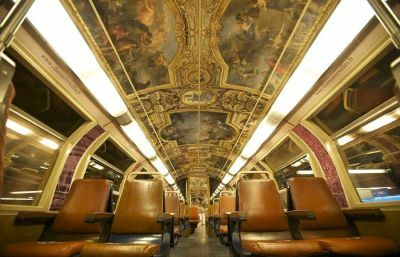 The changes, which were funded by the Palace of Versailles, involved layering the interior walls of the train with a high-tech plastic film. The refurbishments were carried out thanks to a deal between officials at the palace and rail operator SNCF. Versailles was the centre of political power in France from 1682, when King Louis XIV moved from Paris, until the royal family was forced to return to the capital in October 1789 during the French Revolution. And then to visit the Palace itself.